Book your Flic en Flac hotel online! Click to visit the Hotel Paul & Virginie website! 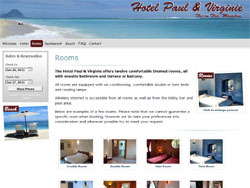 As of February 2011 we have launched a new website to handle all the bookings for the popular hotel Paul & Virginie in Flic en Flac. Please visit our new website Hotel Paul & Virginie to check availability, read more about the Hotel Paul & Virginie and complete your reservation online. You can continue browsing our other accommodations by clicking here. To find out what others say about Bungalow Vanille, please see our testimonials section.